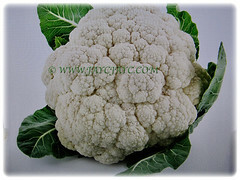 Cauliflower or Calabrese has medicinal properties. It is anti-inflammatory and antioxidants-rich and may boost both your heart and brain health. Regular consumption of Cauliflower will provide your body with impressive amounts of vitamin C, vitamin K, beta-carotene and much more while supporting healthy digestion and detoxification..
Botanical Name: Brassica oleracea var. botrytis (syn. : Brassica cretica ssp. botrytis). 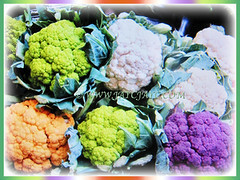 Common Names: Cauliflower, Broccoli, Calabrese, Romanesco. Etymology: The origin of the name is from the Latin word caulis, meaning cabbage flower. The varietal epithet botrytis stems from a Greek word that means a cluster resembling a bunch of grapes. Origin: Native to coastal, southern and western Europe. It’s cultivated elsewhere around the globe. Features: Brassica oleracea var. botrytis is from the genus Brassica that comprises of 37 species of flowering plants. It is an annual herb with a compact growth form. Typically, only the head is eaten, that is the edible white flesh or curds. 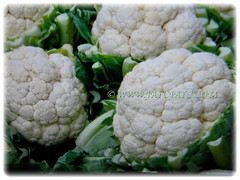 The cauliflower head is composed of a white inflorescence meristem. Its oblong leaves are widely spaced in a rosette. Its yellow flowers have petals that form a cross-like shape. Culture (Care): Brassica oleracea var. 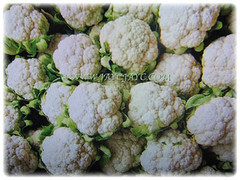 botrytis or cauliflower grows easily with the least maintenance. Soil: Deep soil rich in organic matter. Others: Long periods of sun exposure in hot summer weather may cause cauliflower heads to discolor with a red-purple hue. Generally free from serious garden pests and diseases. However, the most important disorders affecting cauliflower quality are a hollow stem, stunted head growth or buttoning, ricing, browning and leaf-tip burn. Among major pests affecting cauliflower are aphids, root maggots, cutworms, moths and flea beetles. The plant is susceptible to black rot, black leg, club root, black leaf spot and downy mildew. For subtropical and temperate regions: Hardiness: USDA Zone 3-10. As weather is a limiting factor for producing cauliflower, the plant grows best in cool daytime temperatures 21-29°C with plentiful sun and moist soil conditions high in organic matter and sandy soils.The earliest maturity possible for cauliflower is 7-12 weeks from transplanting. 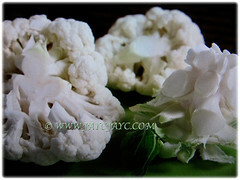 Cauliflower is grown as cool season annuals. They do best with temperatures around 15.6ºC. It can tolerate light frosts and temperatures down to -3.8ºC or so. Too much cold, too much heat, not enough water, too much water, not enough lime or too much nitrogen, and you end up with small, misshapen or rotted heads. Cauliflower is less frost-hardy than broccoli, and less tolerant of high temperatures, too. But long days and warm nights will cause cauliflower to deteriorate. Although cauliflower is often considered a vegetable suited for temperate climates, it has been grown in tropical areas of Africa, Central America and South America. 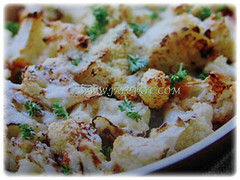 The milky sweet and nutty flavour of cauliflower is at its best in the winter months. Propagation: Easily propagated from seeds which usually germinate in about a week. 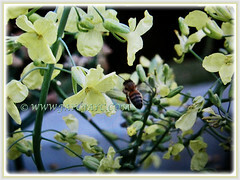 Usage: The flowers and their flower stalks of Brassica oleracea var. 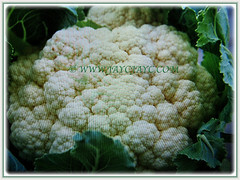 botrytis or Cauliflower are harvested early in the undeveloped stage. They are consumed raw or cooked in a variety of methods, such as stir-frying, steaming, boiling or baking. Cauliflower, like the other cruciferous vegetables, such as broccoli, cabbage and kale contain compounds that may help prevent cancer. These compounds appear to stop enzymes from activating cancer-causing agents in the body, and they increase the activity of enzymes that disable and eliminate carcinogens. It is anti-inflammatory and antioxidants-rich and may boost both your heart and brain health. Eating cauliflower will provide your body with impressive amounts of vitamin C, vitamin K, beta-carotene and much more while supporting healthy digestion and detoxification.